David Reid served 23 years in the US Navy Reserve as a Naval Intelligence Officer, where he retired as a Commander (the equivalent of a US Army Lieutenant Colonel). While in the Navy, CDR Reid was awarded the Navy Commendation Medal, the Navy Achievement Medal, and the Director of Central Intelligence Meritorious Unit Citation. CDR Reid made two deployments to South Korea, one deployment to Iceland, a field deployment with the US Army, and participated in a NATO exercise on board the USS Mount Whitney. 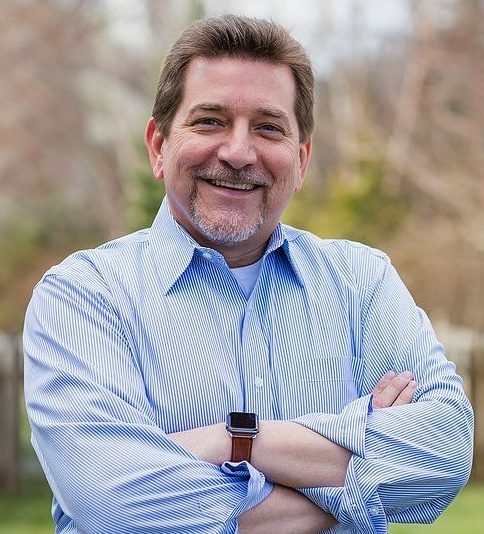 Along with serving in the Navy Reserve, David has over 30 years of experience in strategic management, banking, global telecommunications, and the defense industry. He also volunteered as a recreational and travel soccer coach, and team manager for Ashburn, Loudoun, and Reston soccer clubs. David is also a national and state certified soccer referee, where he still referees high school soccer games in the Ashburn area. David and his wife of 22 years have lived in Ashburn since 2000. Their daughters attended Loudoun County Public Schools and received an outstanding education at Mill Run Elementary, Eagle Ridge Middle School, and Briar Woods High School. Their eldest daughter is now a junior at the University of Virginia and their youngest daughter is a sophomore at Lynchburg College. David holds a B.A. in Political Science from Northeastern Oklahoma State University and a Master’s Diploma in Strategic Intelligence from the Joint Military Intelligence College. Read more on David&apos;s website. We need to focus on bringing more high-paying, high-tech jobs to Loudoun County. Northern Virginia is quickly becoming the technology innovation hub of the East Coast. We are at the center of core population areas, we have great universities, and a well-educated population. Let’s take advantage of these resources to fully achieve our potential in space technology, alternative energy, data centers, advanced transportation solutions, and federal contracting.Securing Our Fair Share of State FundingFor every $1 Loudoun County sends to Richmond, we get less than 30 cents back, with some estimates putting the amount as low as 18 cents on the dollar. We need to reassess these funding formulas, find out where our tax dollars are going, and bring more of our money back to Loudoun County to address our very real transportation, education, and public safety concerns. If you drive anywhere in Loudoun County or Northern Virginia, your commute has gotten worse over the last seven years. Northern Virginia is the economic engine for the state and we need to ensure this engine is not crippled by gridlock. Since 2000, the cost for an end-to-end trip on the Dulles Greenway has gone from $2 to over $6. That’s more than a 300% “road tax” increase. We need to explore options to implement “distance pricing”, so routes between exits are prorated, or purchase the Greenway from the developer and add it to the VDOT system. Implementation of full-day kindergarten for all children in Loudoun County and making an investment in early childhood development provides the foundation for children to become positive contributors to our community. Loudoun is one of only three jurisdictions in Virginia without full-day kindergarten and the politicians in Richmond have not done enough to ensure its implementation. As delegate, I will fight for increased initiatives to develop 21st century skills that will drive Virginia’s economy forward. I support equal pay increases for all state employees, including teachers. We must break the cycle of saddling our youth with excessive student loan debt. The state’s strategic plan calls for the state to pay 50% of the in-state tuition costs, but it has only been funded at approximately 33%. UVA, for example, only receives 8% of its funding from the General Assembly. Since 2009, in-state tuition and fees have increased by approximately 7% annually and increases have sometimes been as high as 10% and 13% annually. This is a hidden tax on every parent with a child in state college in Virginia. The Pentagon identified climate change as an external force that increases the likelihood of mass migrations of displaced people. Additionally, the Department of Defense has found that our actions to increase energy and water security, including investments in renewable energy sources, will increase the resiliency of domestic installations utilized to support training activities. Virginia must do its part in addressing these issues by generating new, high-tech energy jobs and creating a business environment where renewable energy can flourish. Only a woman and her doctor should be making decisions about her health and her body. I fully support a woman’s right to make personal decisions about her health and her body without the state limiting her options or trying to shame her about these very personal decisions. To have a growing, diverse, inclusive, 21st economy, we must respect the rights of all people to live, love, and worship, as they desire. The diversity of who we are, where we’ve come from, and how we worship is what makes us stronger.